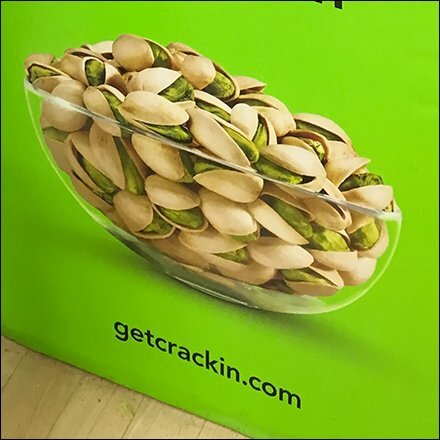 The global Pistachio consortium here reaches to the Grocery Floor with a this Get Crackin’ With Healthy Snackin’ Pistachio Display. Eye-catching green color, yes. But the only tie to a brand is the getcracking.com URL, possibly offering menu and use suggestions beyond cracking. Ocean Spray Cranberry Cooperative watch out. There is a new boy on the block. Consider this Get Crackin’ With Healthy Snackin’ Pistachio Display in the gallery of images.